There were at least 20 incidents of "spontaneous" demonstrations this week against troops assigned to the United Nations Interim Force in Lebanon (UNIFIL). UNIFIL is an ineffective multinational force assigned to southern Lebanon to oversee a series of ineffective UN resolutions. The force was constituted as part of Security Council resolutions 425 and 426 in March of 1978. You read that correctly - this "interim" force has been there for over 32 years. I submit that they have not accomplished anything. Hizballah has not only remained the key power broker in southern Lebanon, they are fast emerging as the main power broker in the entire country. Arms flow freely into the area, in direct contravention of a series of UN resolutions - 425, 426, 1559 and 1701 to name but a few. UNIFIL reports what it sees, but has never used its fairly impressive arsenal to enforce any of the myriad resolutions that are violated on virtually a daily basis. In 2006, I was surprised that the Israelis agreed to the provisions of UNSCR 1701 that expanded the role of UNIFIL to implement the terms of the ceasefire. UNIFIL has never been neutral - or effective - so it is just inane to hand them the mission of preventing Hizballah fighters from "returning" (they really never left) to the area south of the Litani River, as well as preventing the re-introduction of weapons into the area. It has failed miserably. Hizballah has a larger and far more capable - in terms of both range and lethality - arsenal than prior to the 2006 war, more capable than at any time in its history. After the war, the Lebanese government was pretty much co-opted by Hizballah to the point that Hizballah not only now holds a significant number of seats in the Lebanese parliament, but exercises virtual veto authority over Lebanese government actions. Its militia could probably defeat the Lebanese army - they are probably one of the finest irregular military forces in the world. The Lebanese government has legitimized both Hizballah's political status and its well-organized, Iranian-trained and equipped militia. The militia, in accordance with numerous international agreements, was to be disbanded when "all foreign forces" departed the country. Forget the Syrians, since no one on the Lebanese side would even broach the subject of 30,000 Syrians in the country - this was about the Israelis, who occupied the the south of the country from 1982 to 2000. 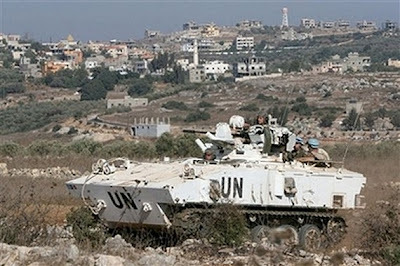 After the United Nations certified that the "foreign forces" - Israeli troops - had left Lebanon, the Lebanese government declared that Israel still occupied a small piece of Lebanon called the Shaba' Farms. They re-iterated that in the aftermath of the 2006 war. The Shaba' Farms area is not even Lebanese, it is Syrian. It is occupied by the Israelis, yes, but it's not part of Lebanon. Both Lebanon and Syria claim that the small strip of land adjacent to the Golan Heights has been transferred from Syria to Lebanon decades ago. There is no basis for that claim. It is a manufactured excuse for Hizballah to maintain its militia. See my earlier The Shaba' Farms - Hizballah's Fig Leaf. What I think we are witnessing now is a planned campaign orchestrated by Hizballah to force the United Nations to withdraw UNIFIL from southern Lebanon. It will start with these "spontaneous" demonstrations and escalate into larger rallies and protests. The Lebanese are very good at this sort of behavior - they forced the Syrians to withdraw with this same tactic. Hizballah means to control Lebanon - they'll continue to move politically where they can, and militarily where they need to. UNIFIL, although effective, is a foreign force in their territory. These small, low-level demonstrations may the start of the effort to remove them. In the end, whether UNIFIL remains deployed to southern Lebanon is really immaterial. They are ineffective to be sure, but allowing Hizballah to force them out is yet another victory for Hizballah.